It's 2 AM. You're staring at the ceiling, willing yourself to go back to sleep, knowing that you have to get up soon. Why won't your brain shut off? Go to sleep already!!! Bored, you reach over and grab your phone, mindlessly browsing social media and internet sites. 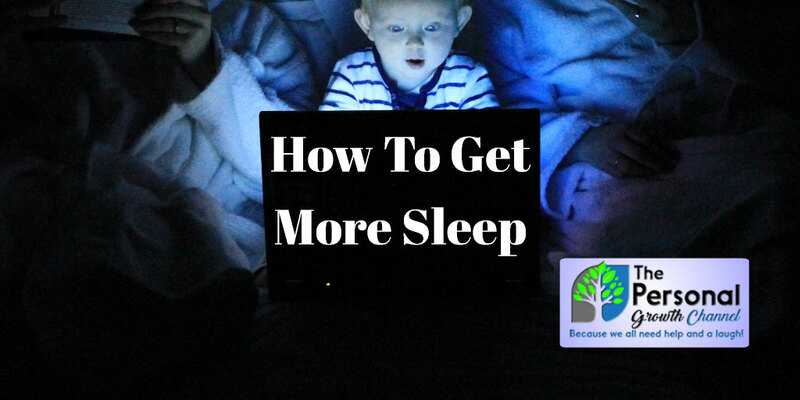 Maybe you even searched for "How to get more sleep" and found this article. Hours later, you finally pass out, just in time for the alarm to go off. Groggily, you get out of bed and start your day, exhausted once again. Sound familiar? This is a very common problem, with 1 in 3 adults in the US not getting enough sleep according to the CDC. This has been a huge problem for me in the past, but I think I've about got it solved. Here are ten strategies that have helped me get a better night's sleep. Sleeping less than 7 hours per night on a regular basis is associated with many adverse health outcomes according to a joint consensus statement of the American Academy of Sleep Medicine and Sleep Research Society. Here are a few of the many health risks of sleep deprivation. Nearly every expert agrees that going to bed and waking up at a consistent time is one of the keys to getting more sleep. It's easier said than done especially when you have kids like I do, but if you can get yourself in a routine of getting to bed at a certain time, your body will adapt to that. I've gotten to the point where I usually wake up shortly before my alarm goes off because I get up at a consistent time each day. Consistent sleep times will allow your body's natural circadian rhythm to work best, leading to a better night's sleep. Ahh, the old cell phone. It lures you in...Twitter, Facebook, Reddit, SnapChat, e-Mail, games. What's that notification? I should really check that... Oh crap, what time is it??? Shut those notifications down! Most modern phones have a do not disturb setting. With over 14,000 followers on Twitter alone, I get a ton of notifications, which used to keep me up. Now I've got mine set to go into do not disturb other than phone calls from 9PM-6:45 AM so that it doesn't interrupt my sleep. Click here for instructions for the Android or here for instructions for the iPhone. If nothing else be sure to turn on blue light filtering on your phone as well several hours before bed as that is known to interfere with sleep. My phone is set to filter blue light and dim the screen from 8:30PM to 6:45 AM. Click here for how to do that for most popular phones. Better yet, turn off and charge your phone outside of your room. I'm still working on that one...do what I say, not what I do! If you are not comfortable, how can you expect to sleep? We purchased a new mattress a while back which made a huge difference, especially for my wife who could never get to sleep on our old one. You don't even need to leave the comfort of your home to get this one solved. Our affiliate partners nectar and DreamCloud both offer a 365-night trial on their mattresses so you can try them risk-free with just a few clicks. With five children and two businesses to run, I'm the first to admit that reducing stress is much easier said than done. Exercises such as meditation, yoga, and controlled breathing have been shown to reduce stress to get a better night's sleep. Journaling an hour or two before bed can also help with reducing stress by getting issues down on paper and out of your head. Exercise can also help with your stress levels, which brings us to the next point. Controlled studies have repeatedly shown that regular moderate exercise can dramatically improve sleep patterns as well as alleviate mental health issues such as depression. Physical health is intimately tied to mental health, which is why some people who have gone through our healthy habits coaching program say that it is "life-changing". I personally signed on with a personal trainer which has allowed me to stay in a healthy routine and get that little extra push I need to stay motivated even though I am a coach myself. We all need someone to give us that little extra nudge at times. Research suggests that people who drink more may fall asleep faster, but it interferes with important restorative sleep cycles. Long-term use of alcohol can also worsen sleep apnea problems and lead to many other issues such as sleepwalking, sleep talking, and memory problems. Spicy foods can increase problems with sleep apnea, increase body temperature, and cause heartburn according to studies from Johns Hopkins. Avoid spicy foods for at least 3 hours before bedtime. Consuming caffeine within six hours of bedtime has been shown to reduce sleep duration by up to an hour according to research. 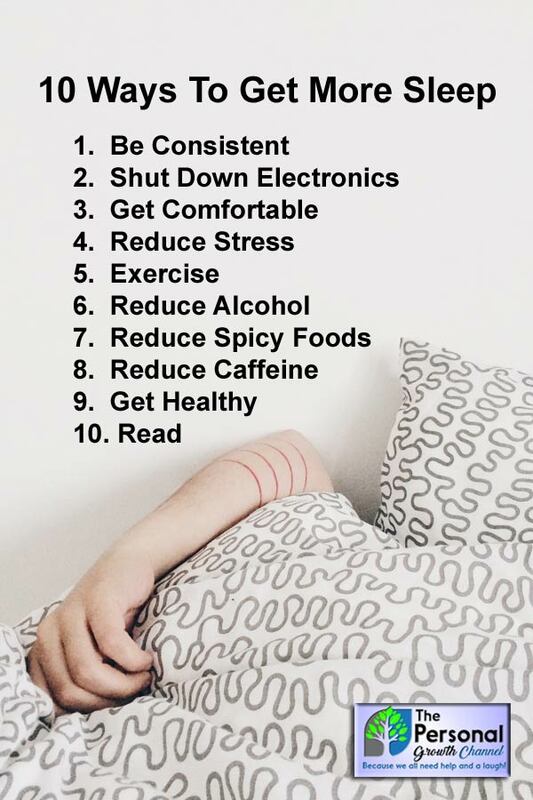 Reduce or eliminate it to get a better night's sleep. I've personally found that restricting my caffeine intake to before lunch only significantly improves the sleep I get and how I feel the next day. Eating healthy and maintaining a healthy weight has a significant positive impact on sleep, say researchers. Conversely, getting enough sleep but not too much can help you maintain your health, so both of these are intimately tied together. If you need a little help in this area, click here to sign up for coaching to get back to healthier you and take back your night! Personal development books like those recommended in our personal development book club can be a little challenging to read, and frankly can cause some people, myself included, to fall asleep a little quicker :). Kill two birds with one stone by learning some new things and getting a better night's sleep when you read before bed (with a physical book whenever possible or with blue light filtering turned on if you use an electronic device). Click here to sign up for a free recommendation each month.